A set of quantities specifying the orbit of a member of the solar system or of a binary star system, used to calculate the body's position at any time. The various features of a trajectory such as the angle of departure, maximum ordinate, angle of fall, and so on. The specific values of the coordinates used to define the position of an aircraft or vessel. Dramatization of the four elements. Sixteenth-century woodcut. Courtesy Fortean Picture Library. Empedocles, the Greek philosopher of the fifth century BCE, advanced the theory that all things were made up of the four elements of air, fire, water, and earth. This theory became widely accepted and is still recognized by modern occultists. The four elements are associated with the four cardinal points of the magic circle. East is Air, South is Fire, West is Water, and North is Earth. Symbolic meanings are associated with each of these elements. Air and fire are both considered positive, active, creative, and masculine elements, while earth and water are negative, passive, receptive, and feminine elements. As with Ceremonial Magicians, Witches consecrate their working tools and other sacred objects by utilizing the four elements. Rosemary Guiley gives the following correspondences for the four elements: Earth: The north; the pentacle; female principle; fertility; darkness, quiet; practicality; thrift; acquisition; patience; responsibility; boredom; stagnation; the materialization of cosmic powers; the color green; the metal gold. Air: The east; the wand (in some witchcraft traditions, the sword or athamé); male principle; intellect, energy, endeavor; sociability; squandering, frivolity; the expression of the magician's will; the color yellow; the metal silver. Water: The west; the cup, challice and cauldron; female principle; fecundity; body fluids; magical brews; the rhythms of nature; emotions, sensitivity, receptivity; instability, indifference; the color blue; the metal silver. Fire: The south; the sword or athamé (in some traditions, the wand); male principle; action, courage, defense against hostile forces; struggle, animosity, jealousy, anger; the color orange; the metal gold. A fifteenth-century woodcut depicting the four elements: wood (Earth) burned by flames (fire) while a bird (air) flies above the sea (water). Reproduced by permission of Fortean Picture Library. The primary categories by which the signs are classified are the four elements (earth, air, fire, and water) and the three qualities (cardinal, mutable, and fixed). Each of the 12 signs of the zodiac is a unique combination of an element and a quality (e.g., Aries is a cardinal fire sign, Taurus a fixed earth sign, Gemini a mutable air sign, and so forth). The elemental nature of a sign is said to refer to its basic temperament, while its quality refers to its mode of expression. People whose only contact with the word element was in a science class immediately think of the materials diagramed by the periodic table—oxygen, iron, hydrogen, silicon, and the like—when they hear the term. It thus strikes them as strange to consider earth, air, fire, and water by this designation. The astrological elements derive from the elements of ancient Greek philosophy. Classical philosophy and modern science share an interest in discovering the basic—the “elementary”—building blocks of the world. 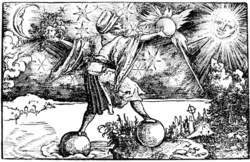 Prior to the advent of contemporary atomic theory, intelligent people examining the world in which they lived observed that all tangible things could be classified as solids (earth), liquids (water), or gases (air). Sources of heat and light, such as fire and the Sun, seemed to constitute a fourth factor (fire), which can be thought of as “energy.” When reworded as solid, liquid, gas, and energy, this ancient scheme of classification is not really so strange. When the ancients analyzed the human being in terms of these four factors, it appeared to them that the physical body was earthy, feeling and emotions watery, and thoughts airy. The fire element provided the spark of life that animated the human frame with activity. From this way of looking at human nature, it was but a short step to regarding sensitive, emotional people as having more of the water “element” in their constitution than their fellows, mental people as having more air, practical people as having more earth, and energetic, active people as having more fire. When astrology was being systematized in ancient Greece, this “psychological” system was applied to the 12 signs, resulting in a classification according to the four classical elements: the fire triplicity, Aries, Leo, and Sagittarius (energy signs); the earth triplicity, Taurus, Virgo, and Capricorn (practical signs); the air triplicity, Gemini, Libra, and Aquarius (mental signs); and the water triplicity, Cancer, Scorpio, and Pisces (emotional signs). One finds the same set of four elements and the same classification of signs by element in Vedic astrology. The connotations are basically the same as in Western astrology. In contrast, there are five elements in Chinese astrology—earth, water, fire, wood, and metal. In this system, the elements are not permanently associated with each of the signs of the zodiac. Rather, each one of the 12 signs of the East Asian zodiac can be a different element. For example, an individual born as an Ox in 1949 is an earth Ox; an Ox born in 1937 is a fire Ox; an Ox born in 1973 is a water Ox; etc. It seems to me to be derivative, and to consist largely in BELIEFS: beliefs that what constitutes the thought is connected with various other elements which together make up the object. There is one element which SEEMS obviously in common among the different ways of being conscious, and that is, that they are all directed to OBJECTS. Here is how Carlyle describes his new friend: "A fine, large- featured, dime-eyed, bronze-coloured, shaggy-headed man is Alfred; dusty, smoky, free and easy; who swims outwardly and inwardly with great composure in an articulate element as of tranquil chaos and tobacco smoke; great, now and then when he does emerge; a most restful, brotherly, whole-hearted man. The sharing of data elements will markedly reduce the costs of redundancy and collection of exclusive data elements making the decision-support databases affordable and, more importantly, complete. Custom Electric offers replacement heating elements for virtually all styles of electric and gas furnaces, including elements for aluminum melting and holding furnaces and diecasting machines. 41(d)(1) to the facts, the IRS also applies the "shrinking-back" rule, under which the qualified research tests are to be applied first at the level of the discrete business component to be held for sale and then to the next most significant subset of elements (if all aspects of the requirements are not met at the first level). Storage Networking is the practice of creating, installing, administering, or using networks whose primary purpose is the transfer of data between computer systems and storage elements and among storage elements. Francis said the Moorpark council approved the 3,221-home development without checking whether it is compatible with all of the elements of the city's General Plan. To begin the FEA, the handle is broken into the small rectangles or finite elements as shown in figure 2. To address such contact problems, many developers of finite element analysis software have included gap elements, more precisely called interface elements, in their element libraries. In order to accommodate demand from a wide variety of industry participants, classes will be provided both at the Secure Elements training facility in Herndon, Virginia or at a customer's facility. Today, there are 112 known and named chemical elements, Elements are arranged according to their increasing atomic numbers.